If you’re around me for much longer than about an hour, the note taking app Evernote probably comes up in our conversation (smile). When I first got my iPad about 5 or so years ago, I just knew that was going to make me super productive and organized. And it has. Why? Because I really embarked on a path of being intentional about my digital organization life. One of the first things I wanted to do was to get my ideas and notes more in one place. Up until discovering Evernote, I loved journals. Still do. Now I just collect them. My journals, although pretty, weren’t terribly efficient sometimes. I would have notes and ideas scattered about. But I never seemed to have the right journal when I needed it. So when I purchased my iPad, I researched “productivity apps” and up popped Evernote. I installed it, and like many of you, didn’t really use it. But I consistently ran into the same issue of notes scattered about and still feeling disorganized despite being intentional about capturing my thoughts and ideas. 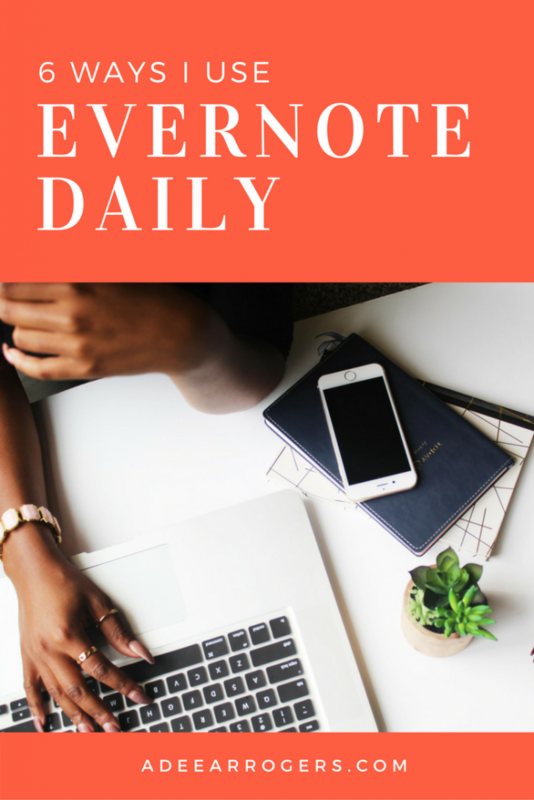 I decided one day that I was going to learn how to incorporate Evernote into my daily life. I read blogs, watched videos–and started to implement a system. I admit, that system has changed over the years to one that is relatively simple in comparison to the ones I researched and used. Since embarking on full-time self employment, I have become even more reliant on Evernote. So much so that I became an Evernote Certified Consultant in August, 2016. (you can find me by searching my name or choosing under North Carolina here). For the majority of the content I teach on Periscope, I have an outline or talking points that I create in Evernote. No matter where or how inspiration strikes, I can organize my thoughts before hitting start broadcast. I access the notes via my iPad while livestreaming. NOTE: Talking points can also serve as a guide or outline for webinars, written content, courses, etc. Whether overnight or a week or more, organization travel can have multiple moving parts. Airline and hotel confirmations, conference registrations, receipt tracking, etc. I created a travel notebook stack (multiple notebooks grouped together) to keep the items related to one trip together. No more franctically scrolling through emails trying to find itinerary numbers or reservations. I keep all of that in one place! Here is an example of how you can organization your travel notebook stack. I suggest organizing it by city/state/year and/or conference/event/year. I also create a separate notebook for Membership numbers (such as airline and hotel rewards). Again, all I have to do is go to one app in one folder to access all the information I need regarding a trip. Just starting out in the digital info space, I was looking for opportunities to share my content without always having to invest goo-gobs of money. Enter Evernote again. Through shared links and an email list, I’ve been able to distribute content to hundreds of people. With this, I am able to keep things organized while I create content without having to create something separate. This does require participants to sometimes stretch themselves and learn to access information via Evernote. But ultimately, I believe in Evernote so much that I believe it is for their good. The other beautiful thing about this is that if I update or make changes while teaching, I can add the updated content. All participants have to do is refresh the note to get the updated content. Note: I do not share notebooks because I do not want them to have the ability to change the content of the notes or notebooks. I have log in information for sites that I don’t access frequently. I can keep the log in information in one place and use it if I forget my log-in. The primary instance I use this is for affiliate marketing to log in to a brand’s affiliate site. 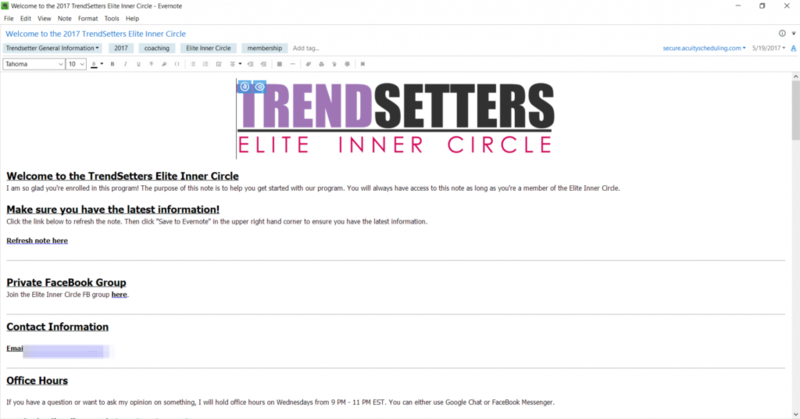 Running a membership site or group can be a lot to manage. 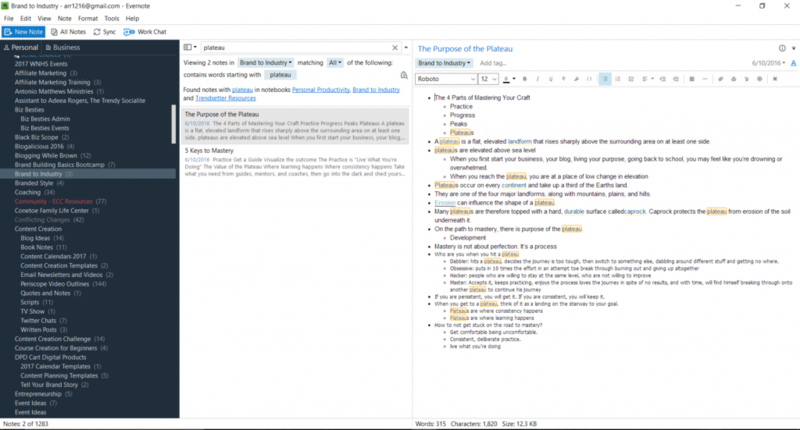 Evernote has been a tremendous help in keeping all the information I want my tribe to have access to in one place. I can include links, how to’s, and reminders. They get the link to this note when they join. As most of us are, I work on multiple things simultaneously. Not just for my biz, but for church, friends, sorority, etc. I am able to have notebook stacks and notebooks for all of my projects, committees, events, etc.. With access on all of my devices, it helps me to stay organized. This simply scratches the service of how you can use Evernote. 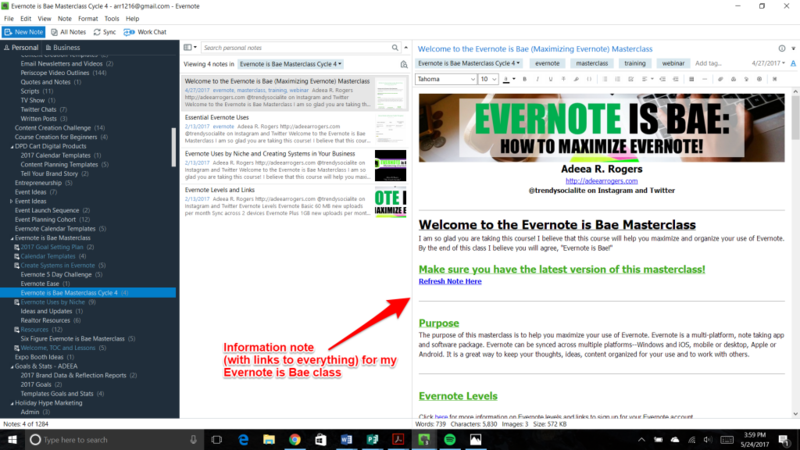 I cover much more in the Evernote is Bae Masterclass and personalize it for others with the Evernote consultation. Click the photo below for more information about Evernote and the opportunities I have to incorporate Evernote into your daily brand and personal life.